We're big fans of both Gunman Clive games, which are among the finest releases on the 3DS eShop and are also available as a collection on Wii U. Developer Bertil Hörberg has certainly demonstrated his design flair and ability to create tight platformers with some retro feel. Hörberg has taken his degree of homage to retro systems to another level with a Game Boy ROM release, fully playable, that consists of the first level of the début title. The following key details were given. Works on every Game Boy model, or any decent emulator. Runs at 60 fps with (almost) no slowdown. It's a really neat achievement, and can be downloaded from this website. Will you be giving this a try? Thanks to all that sent this in. Eh, just submitted the tip after making this video. Feel free to add it to the post. Incredibly cool work! I want this as a full physical release! EDIT: Playing it now. Pretty cool, perhaps the music temp is a bit slower than the originals. Too bad its only one level. Was fun. That's... INSANELY COOL! Any chance he's gonna convert the entire game? Played it and its incredible attention to detail is mental. To manage to make it virtually identical to the original must have taken some work. Incredibly authentic adaptiation. I feel oddly nostalgic just looking at that picture haha. You can tell the developer is a 80s / 90s man that really appreciates the games from that time. Or as we can call it now...Gayman Clive. Full release please! 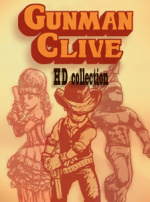 That or DLC for the original Gunman Clive I & II! Nice. Of course he won't release the whole game, or nobody would buy the full version. reminds me of some lucky luke game i had for gameboy as a kid. LOVED that game !!! @Nintendo_Ninja I would.Also a 3DS vc release should happen too. Just played it. Just the same as the proper Gunman Clive. This would have been an amazing Game Boy game if the full game had been released during the early nineties. Nice gesture and nicely executed! This is pretty damn cool. Not a huge fan of Gunman Clive, but this is nice nonetheless. An extremely impressive adaptation. Everything about it is perfect. I was especially floored by how the soundtrack was meticulously adapted to the framework of the Game Boy hardware. Bravo. I think it's time that Bertil moves on to do something different though. Sure, he can revisit Gunman Clive in the future; perhaps even have him star in an all new game, but as good as it is, I'd like to see him produce something different, whatever it may be. That's pretty cool, even though I don't enjoy the game at all. Maybe I'd like it better if it were a GB game rather than 3DS, seems more fitting. That was fun, I have both 3ds games, and now this and the ios Clive 1 on my my phone. Didn't know there was an app of Clive...nice job, keep em coming Hörberg..
You gotta give credit to a developer who does stuff just because he can. I love fun little stuff like this. If I knew how to code, I always wanted to make a version of Smash Bros. and Mario Party for the SNES. I bought this on 3DS (both games) and I'm glad there's a GB version. I'd definitely grab a VC version if there was one right now. Just tried it on the 3DS VC emu, it's fully compatible. I have to give this a try. Gotta try that later. I always liked the idea of puting one's work into a cardridge - GB cartridge here. And this is a clever thing actaly. It's a good advertisement for the game. Plays as a curious demo. Just played it on emulator. Pretty cool. They/he should make a full Game Boy game out of it, and actually sell it at a relatively cheap price. What's wrong with it then? Other than the simplistic backgrounds obviously. Just played the game on my 3DS (via R4) And even though it's a remake of the first Gunman Clive, It works and plays great! Just played it. Very neat! @invictus4000 First of all your comment doesn't even make sense to me. Secondly, you're an idiot.